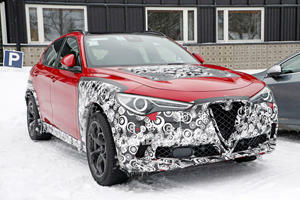 The Stelvio is Alfa Romeo’s first foray into the world of SUVs and it challenges the class-leaders from the get go. Powered by a 280 hp turbo inline-four which is mated to an 8-speed automatic transmission the base model offers class-leading acceleration. Drive is to all four wheels and a choice of two driver assistance packages provide additional safety on the road. The generous specification levels can be further enhanced by opting for the Sport (paddle shifters and larger wheels) and Ti (heated seats and upgraded in-car entertainment) trim levels. The surging popularity of the SUV has finally spread to corners of the automotive world that were once considered no-go areas for anything other than pure performance machinery. BMW and Porsche succumbed early on and now even Jaguar and Maserati have entered the fray. 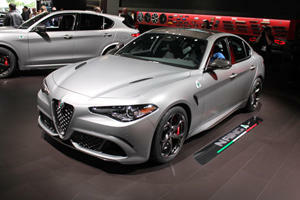 It was perhaps inevitable that Alfa Romeo, generally a purveyor of sports sedans and coupes, would follow suit. Straight out of the blocks it scores a small victory, being named after a famed mountain pass as opposed to a spicy vegetable or random letter; the Stelvio is a handsome thing to look at too. It manages to mask the ungainly proportions of an SUV with elegant, flowing lines and inject it with the Italian design flair that is usually reserved for its sportier offerings. The good looks continue to the interior where Alfas of old usually tended to fall down. The infotainment system is logical and easy to use, the seats are comfortable and minor controls feel good to the touch. The dashboard plastics are perhaps a weak point but in general there is an air of solidity that was not always a given with Alfa Romeos in the past. Standard specifications are high, including 18-inch wheels, power tailgate, and 10-way power seats. Ti trim adds satellite radio, and a larger infotainment screen as well as heated seats and front parking sensors. Customers can opt for a Sport package too which adds some nice touches such as paddle shifters, aluminium interior trim, larger wheels and gloss-black exterior trim. There are also two driver-assistance packages to choose from which enhance the Stelvio’s safety credentials. Adaptive cruise control, lane-departure warning, auto-dimming mirrors and high-beams are all on offer. Apple CarPlay and Android Auto features are also being phased in to cars during the course of the year. Push the starter button (located on the steering wheel) and as you pull away first impressions are that the ride and interior noise levels are rather quite good. Opting for larger diameter wheels does not harm the ride either. 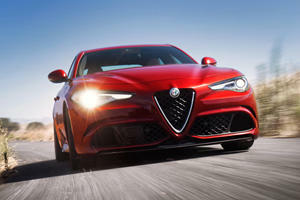 Those fearing that the package falls apart once the road get twisty can breathe a sigh of relief too, the Stelvio is based on the new Giorgio platform, the same as in the Giulia sedan and the standard rear-biased four-wheel drive system ensures that all the power is deployed out of even the tightest hairpins. Weighing less than an equivalent GLC or X3 it feels that much more agile on the road. Initially there is only one model on offer, featuring a powerful 280 horsepower 4-cylinder turbocharged engine, it punches hard with 60mph arriving in a class-leading 5.4-seconds. Paired with an 8-speed automatic transmission, it shifts between ratios smoothly when cruising and is equally adept at keeping the motor in the meat of its 306 lb-ft of torque when pressing on. Serious performance enthusiasts may also be interested in the fire-breathing Stelvio QV which comes packed with a 505 hp turbo V6. 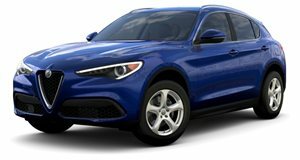 Alfa Romeo is not exactly a volume manufacturer here in the States, although that may all be about to change if the new Stelvio is anything to go by. Long term reliability is an unknown at this early stage but first impressions are promising and the basic warranty covers you for the first 4 years and 50,000 miles in case something does go wrong. Offering class-leading performance, stunning looks and an immersive driving experience, the Alfa Romeo Stelvio is a very compelling package in this competitive class.